The BKOC has reserved the back room (dubbed, "The Menino Room / JFK Room" topped off with a giant TV) at Doyle's starting at 7p.m., though I'm fairly certain that they will be more than happy to allow you to come and begin drinking their liquor and eating their food earlier if you prefer. It also seems to be appropriate to point out that Doyle's is very, very close (we're talking walking distance close) to Circles Knitting Salon for those of you needing any last minute training or performance aids. The lovely folks at Circles is also offering a 15% discount for Team Boston members on opening day, so stop by say hello -- and maybe buy some stuff...seriously, there's some very yummy yarn here. Also, please remember that Torino is 6 hours ahead, meaning that official cast on time is 2pm Friday, so don't feel like you have to wait to get to Doyle's to cast on. Just sayin'. Comments: When posting comments anywhere here in TOTBVOV, please note that notification will automatically be emailed directly to the AUTHOR of that post, and ONLY the author. Good news = author gets a handy note, feeling all warm and happy and loved. Bad = if you intended that comment for one of the BKOC (Debbie, Wendy, or myself), we won't see it unless we're trolling the comments. Don't get me wrong, we absolutely troll the comments, but it's just not that reliable a way to reach us with any speed. 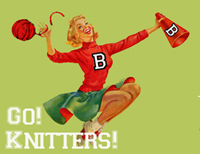 If, however, you need to reach one of the BKOC, feel free to comment to any post by one of us, OR email us at the address on the left sidebar: teambostonknitters at yahoo dot com -- translated into a real email address, of course. 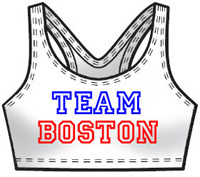 Anyone who has sent a request to join Team Boston, but has not received an email invitation from Typepad to be a guest author, please, please either comment to this post, OR email us again at the above address. There were several issues with Typepad's email services at the end of last week, and we may need to re-send your invitation. This is ESPECIALLY likely to be true if you can already see your name in the list of knathletes on the right-hand sidebar. In general, if you send us a request, and haven't seen a response within 48 hours, it's likely there is a technical glitch, so please feel free to let us know. Do you love these little notes from us? Want to always be able to read them without having to search post-by-post for our witty, urbane commentary? Dude! You're in luck! Links to each individual admin-type post will be over there on the left-hand sidebar under the header "Team News". In addition, all admin-type posts will be given the category 'Notes from the BKOC'. There is also (left sidebar again) an archive by category, which allows you to click once to display ALL admin-type posts at once, making it easier to brush up on all the facts all at the same time. We, the Boston Knitters Olympic Committe (B.K.O.C. 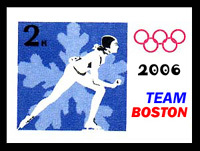 ), would like to officially welcome you all - knathletes, coaches, and cheerleaders alike - to The Official Team Boston Virtual Olympic Village (TOTBVOV)! We hope that you will enjoy your time here in The Official Team Boston Virtual Olympic Village (TOTBVOV), and to that end we have made a few important arrangements that we would like to share with you. The first and most important of these is live television coverage. We, the Boston Knitters Olympic Committe (B.K.O.C. ), have worked closely with NBC and the International Olympic Committe (I.O.C) to bring you unprecedented coverage of this year's games in Torino, Italy, including the highest rate of HD coverage, EVER. For more information, you may visit our joint press release here: http://www.usolympicteam.com/117_42973.htm. Please note the 24.5 hours of coverage PER DAY throughout the 17 days of the games. We are particularly proud of that, because as fellow knitters, we understand that the ability to warp the space-time continuum could well be the KEY to making Knitting Olympics (K.O.) dreams come true. We urge you to read through this press realease for pertinent station coverage details, and also to visit http://www.nbcolympics.com for up-to-the-minute Olympics coverage. However, this brings us to the reality of negotiations. Despite our best efforts, there have been some small negotiating sacrifices on the road to the Knitting Olympics (K.O. ), and one of those was actual LIVE coverage of the Opening Ceremonies in Torino. We felt that free, live, pay-per-view coverage (really, I couldn't make this stuff up, people) of every waking hour of the figure skaters' lives and competitions would, in the end, make you happier. Given that sacrifice, the Official coverage of the 2006 Olympic Games in Torino, Italy begins on NBC at 8 p.m. EST. We, the Boston Knitters Olympic Committe (B.K.O.C. ), have reserved the back room (dubbed, "The Menino Room / JFK Room" topped off with a giant TV) at Doyle's starting at 7p.m., though I'm fairly certain that they will be more than happy to allow you to come and begin drinking their liquor and eating their food earlier if you prefer. We would also like to point out that Doyle's is very, very close (we're talking walking distance close) to Circles Knitting Salon for those of you needing any last minute training or performance aids. Other items on the Boston Knitters Olympic Committe (B.K.O.C.) 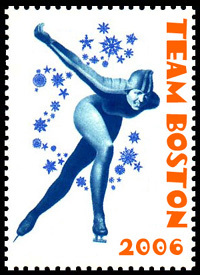 agenda include Official Team Boston Knitters Olympic Knitting pins, as well as plans for The Official Team Boston Virtual Olympic Village (TOTBVOV) Closing Ceremonies Celebration, including a show & tell/fashion show event. Miscellaneous announcements: There have been a couple of requests for us to re-felt the pool tables in the knathlete's lounge near the dining hall, and we are looking into that, however, it seems as though the air hockey table is down for the count. Apparently, it was not as good at quick-drying wet wool swatches as someone thought it would be. Also, the lounge manager has asked us to remind you that the foosball table is NOT to be used as a skeining/drying rack for the handspinners. She seems to think that others would like to use the table for ACTUALLY playing foosball. We know that this is crazy-talk (who has time for foosball? ), but we ask that you respect the rules of the knathlete's lounge. 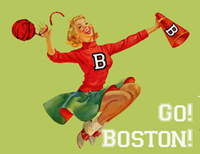 Thanks again to all of you for your support of Team Boston in this year's Knitting Olympics! If you plan on attending the openning ceremony event please leave a shout out here. We need to warn the folks at Doyles. This will give them time to arm themselves with protective glasses to defend them against the flying needles. Buttons for you, Buttons for me. Well, after a bit of a delay, we have some high quality buttons here. They are all 200 pixels wide. Which, I think, is the standard. Ain't they cute? Crafted for you, with love, by Mr. Bookish himself. As you all know, The Yarn Harlot has issued a challenge. Not only is she challenging our knitting bravado, she is asking us to put our collective sanity on the line for her amusement (sure, she’ll say it’s so we can feel some sense of accomplishment, but really, she wants to see us squirm). And against every instinct they possess, many have decided to take up this challenge. But you just can’t do it alone. That's why Bookish Wendy, Obsession Kellee, and Stitchy McYarnpants have decided to co-sponsor Team Boston in the first Knitting Olympics. What does it take to join Team Boston? If you've got yarn and a wicked pissah accent, you’re in. If you live within, let’s say, an hour of Boston, you are hereby a Boston Knitter. We’ve set up this team blog so participants can upload photos and update whenever they want! Share your progress or disappointing lack thereof. Delight in the thrill of your teammates victories or relish in the agony of their defeat (and in the case of sock knitters, da feet). But mostly, improve your odds of actually finishing something using the tried and true method of mob rule. If you’ve joined the Harlot’s Olympics and want to participate in our little support group, comment directly to this post OR send an email to teambostonknitters at Yahoo dot com (you’ll have to turn that into an actual email address. Consider it your first test as a team member). -what you're knitting, if you've decided (if you've already posted a photo of what you're making, include that link). We’ll reply with info that will allow you to become a Guest Poster. Since humans are actually dispensing the invitations manually, you probably won’t get an immediate response, but rest assured, we'll get to you as soon as possible. We've also created an email address for any questions you may have for us. It's teambostonknitters at Yahoo dot com (hey! that's the same address as above, we're geniuses). And remember, if you don't want to join the Olympics but still want to take part in the fun, you can join Team Boston's Cheerleading Squad. You know you want that cute little cheerleader button on your blog. You do. You know you do. Have fun, go nuts, we'll be posting more information, updates and tweaking the site as the days go by. Since many of the Team Boston crew are new to Typepad, we thought it would be good to give you some shortcuts to the 'How To' pages. In addition to the following pages, in the upper right-hand corner of your screen you will see a shortcut to the Help pages, which are laid out in a pretty simple, logical fasion. Also keep in mind that as 'Guest Authors', you can post freely and upload images into your posts, but you can't add things to the 'Podium' photo album, so as you cross the finish line, just make sure one of the B.K.O.C. knows and we'll be certain to get it up on the Podium ASAP!